Integrated Design and Supply, Inc. is a specialty heat trace company that has been established to provide the highest quality products and services available. We have the resources to provide you with cost-effective solutions from conception to start up. We are equally in our element working on a design in the conference room to field services. ​Our staff has over 25 years of heat trace experience and takes pride in applying that experience to provide you with exceptional engineering, product selection, and services. In a hurry? We will custom design a system for your application and ship the same day! We stock miles of heating cable and take pride in shipping orders from stock the same day. 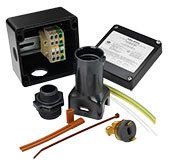 Along with our cable, we have a variety of components, control systems, and accessories to send you a complete heat trace system the day you place your order. Copyright 2018 Integrated Design and Supply Inc.